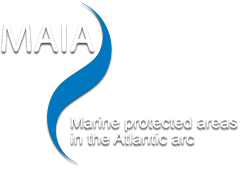 MAIA is co-funded by the Interreg IV B Atlantic Area programme under Priority 2 "protect, secure and enhance the marine and coastal environment sustainably". The Interreg IV B Atlantic Area programme is a transnational cooperation programme within the framework of the "European Territorial Cooperation" objective. It is an instrument of the policy to drive cohesion for the programming period from 2007-2013, funded by the European Commission through the European Regional Development Fund (ERDF) with a total budget of €104 million. The current Atlantic cooperation area comprises the whole of Ireland and the Atlantic regions of Spain, France, Portugal and the UK. The Programme strategy is implemented through four strategic priorities: transnational networks of entrepreneurship and innovation; protection and enhancement of the marine and coastal environment; accessibility and internal links; and urban and regional sustainable development. Je viens de consulter cette page, http://www.maia-network.org/homepage/the_project/co_funder, je te la conseille.